Her Majesty Queen Elizabeth II and HRH Prince Philip opened the World Expo that by day erupted into a pageant of giant balloon flags, a symphony orchestra of 3,000 musicians, water skiers, high divers, helicopters, synchronised swimmers, performers of every type imaginable and at night brought to Expo the unforgettable sight of a pink submarine cruising on the river's surface with 36 tapdancers on deck. Ric Birch was Director of Entertainment and Spectak devised, produced and managed the six month long program of entertainment that followed - including a performing arts festival, a six month program of street entertainment, twice daily parades, an aquacade that was the most popular show of all, nightly concerts on a river stage, nightly laser and fireworks finales, jazz musicians, orchestras, theatre and dance companies. 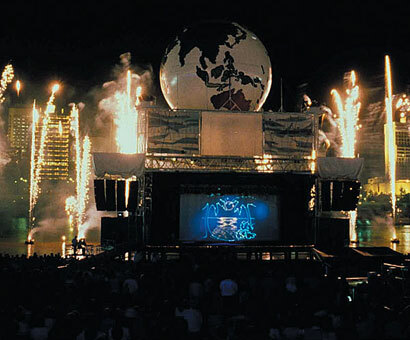 The people of Brisbane wanted the Expo never to end, and to this day there is an organisation dedicated to maintaining the memory of the event. The entertainment program at Expo was credited with more than doubling the projected number of visitors that had been expected prior to opening ceremony - from 7.9 million to 18 million.